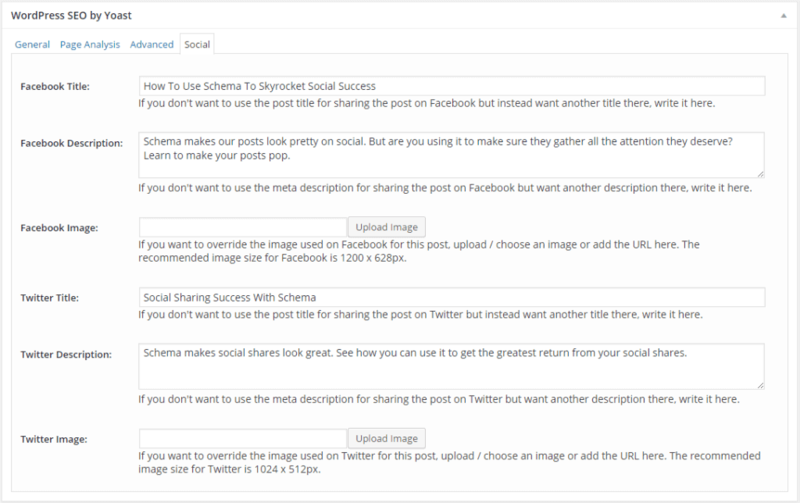 Schema is a must if you want the best from those sharing your content socially. Schema is how social sites like Facebook show great previews of the links you post. It lets you specify the headline, preview image, and description that appears. While most social sites will attempt to put together this information without it, using Schema means we can tell the site exactly how that preview should appear for best results. While many sites have Schema setup to do its thing (the Yoast SEO plugin for WordPress will automatically take care of adding the code to your webpages if you haven’t set it up already), are you sure your message is appearing how you want it to? With tools like Yoast SEO in place, most of us have a tendency to set it and forget it. Knowing the plugin is taking care of our Schema means we can concentrate on other things. But don’t be so quick to leave it alone. Those looking for optimal results will be far better served by taking the time to manage the details. By default, the Yoast SEO plugin will pull things like the blog title, the first image, author and more into creating your social schema. While these generally look good, adding them yourself will ensure the right message hits your readers. To add you own, click the ‘Social’ tab in the WordPress SEO by Yoast window in your WordPress post composer. Now you’re ready to fill in each field with a copy that will help your post perform better than the automatically generated copy the plugin will normally pull. When creating your copy, think about how much space you’ll have to work with on each social network. Twitter headlines and descriptions tend to be kept shorter for a more mobile view while Facebook has a bit more room to work with. Remember that crafting a great headline is critical to getting people to click, so put plenty of thought into it. Buffer published a great guide to creating headlines that I highly recommend checking out. Using the CoSchedule Headline Analyzer is another great tool to help you write headlines that grab your readers. Uploading custom images for Facebook and Twitter is recommended as it allows you to offer social images that are optimized for each network. Be aware of the sizes allowed by each network and use images that meet their maximum allowance, to give you images that appear great in the users feed, no matter what device they’re viewing it on. Picking your own picture also allows you to set the specific picture you’d like to appear rather than having the first one from the post show. Often times, a graphic in the middle of the post will be much more appealing or tell a better story than the opening image. Pick one that will really grab the attention of your readers. Presenting your social best can go a long way to increasing the success of your posts and help the virility. Through the use of social schema and the WordPress SEO plugin by Yoast, you can make create content that will look great, no matter where it’s shared. Take the time to tweak your shares and you’ll be doing the best for social success.